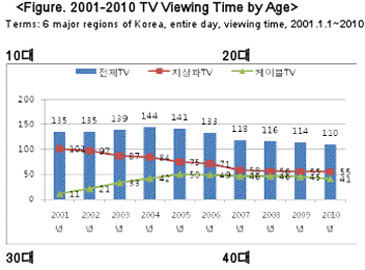 The media research company, TNmS, has analyzed changes in TV viewing behavior by looking at the amount of TV viewing time of households and individuals from 2001 to 2010. The average TV viewing time of a household increased from seven hours 44 minutes per day in 2001 to eight hours 33 minutes in 2010. Terrestrial TV viewing time decreased by an hour, from five hours 51 minutes in 2001 to four hours 51 minutes in 2010. Cable TV viewing time, on the other hand, was 38 minutes in 2001 and was two hours 56 minutes in 2010, growing by staggering two hours 18 minutes. The most noticeable change in TV viewing time over the past 10 years is that the gap between terrestrial TV viewing time and cable TV viewing time has drastically decreased. In 2001 terrestrial TV viewing time was five hours 13 minutes longer than cable TV viewing time of a household, but in 2010 the difference between the two was only 1hour 55minutes, which is three hours 18 minutes less than what it was 10 years ago. From this, we can see the media environment that was more focused on terrestrial TV 10 years ago is now more focused on multi-channels. Cable TV’s improvement in competitiveness is more apparent when we look at the changes according to age. The trend shows that the difference between terrestrial TV viewing time and cable TV viewing time is smaller at a younger age group. In 2010, those in their 60’s or older, 50’s and 40’s watched three hours 41 minutes, one hour 37 minutes and one hour seven minutes more of terrestrial TV than cable TV respectively. This pattern continues to show in younger generations; for those in their 30’s it is 46minutes, and 14 minutes each for teenagers and those in their 20s, which shows that terrestrial TV and cable TV are almost equally popular among younger generations.